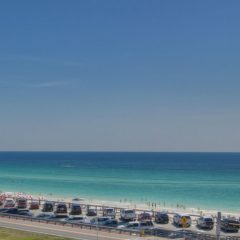 Crystal View is located directly across Scenic Hwy 98 from private beach access and hundreds of yards of beautiful sugar white sandy beach. Only 16 units share this four-story building, It has off street parking and pool also along with that private beach with 2 chairs and an umbrella put up for you every day in season. 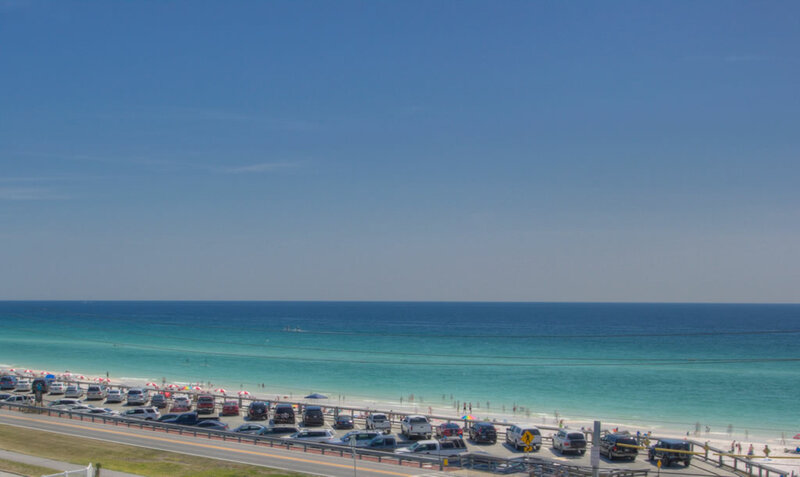 Crystal View is conveniently located on Scenic Hwy 98 approximately halfway between Destin Commons and Silver Sands Factory Stores, so you are only minutes away from shopping, the movie theater, and various restaurants. Pompano Joe’s a great beachside bar and restaurant is a very, very short walk down the paved 5-mile bike/walking/jogging path. Pompano is also a great place for beach volley ball and several rental for parasailing and kayaks. The breathtaking Gulf views from your kitchen, dining room, living room and master bedroom are amazing . The unit is 1,713 sq ft. with three bedrooms with king beds in each , three full baths, 10-foot ceilings with in open floor plan. It has a large fully equipped kitchen with everything you will need to prepare those easy breakfasts and lunches or a large elegant dinner. Best of all we are pet friendly and you can bring you pet with you. The balcony alone is almost 500 sq ft and wraps around the condominium with multiple seating areas for guests to enjoy a book, dine, or enjoy the Gulf views. There is no place better to watch the sea birds and dolphin pass quietly by from this little piece of Paradise.